This is a great story for authors and a peak behind the author curtain for readers. Ever have one of those heart-drop-into-tummy moments when you realize, “Oh poop… this changes everything”? 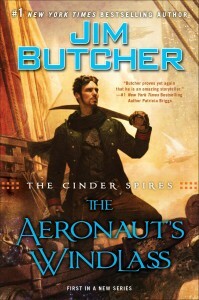 That was me last week as I started listening to Jim Butcher’s The Aeronaut’s Windlass on my commute. I’d heard of the book a little while ago, and even found a paperback copy that sat on the bookshelf for a bit. As I’ve returned to commuting, I wanted to find some audiobooks to listen to; Jim’s was available on Overdrive and I grabbed it. As I started listening my heart dropped. And dropped further. And further. How did Jim write my book? I’ve had the idea for The Dreadship Cycle for some time now. Like most authors, the concept is an amalgamation of scifi/fantasy elements and ideas I’ve collected over a lifetime of reading and movie watching. The usual “Wouldn’t it be neat if I took _____ and did ______?” I’ve kept working notes as ideas for the nations of Gilead, the Imperium, and Golgothan, the dreadships Goliath, Esper, Reaver, and Babel, the Coven who rule the great realm of city-states known as the Dominion, Moondrop and Firefly, a mythology around Tryon the Dying God, the Hollow One, and Lilian the Lady of a Thousand Desires, and the warriors of the fog-enshrouded Velt. The Fireflower and the thaumaturgic engineering marvels of an ancient age. The Norns, thaumaneers, and a crew of misfits. As I listened to Jim’s story, my gut clenched. I couldn’t unhear his ideas. Then a light glimmered at the end of the 20-something-hour tunnel. Sure, his ideas were there, and they were great. It’d be challenging not to find them insidiously incorporated into my own. However, they were also different. Sure, he has airships. So did Super Mario Brothers III. He describes core, trim, and lift crystals and their workings. Similar, but different than my Seed and it’s powering of the helices and the magic that charges them. While I’ll probably target the steampunk crowd, my story is definitely more epic fantasy than his writing. So I regained my hope. The Dreadship Cycle remains in development. It’ll come out when it comes out. I’m still doing world-building activities and I’m not ready to get into the sausage-making of writing yet. I know I’ll need to be aware of story overlap and will be vigilant to root it out. And to Jim Butcher, a virtual mentor and writer I esteem, my apologies if some of that slips in. I promise, I intend no ill purpose. I will do my best with the tropes and avoid the cliches to the best of my ability. Like all storytellers, I receive my influence from what I read, and it’s my pleasure to be one of your readers. For everyone, I certainly recommend the story. The audiobook was well done and engaging. As a submariner, it touched on many memories from my time aboard vessels. Well done sir! ← The Girl & The Golden Mirror, Ascent of the Fallen update, and more!